Whether they are called pergolas, tunnel arbours or basket work bowers, plant covered structures, with their dappled light and summons to linger, always suggest pleasure. This book tells their story. It covers their history and how they have been used and enjoyed over the centuries. It also provides a practical handbook for today's gardener. Special photographs have been taken to show in detail the beauty of the structures and their plants in their gardens settings. The opening chapters feature those periods from Ancient Rome to modern Barcelona when pergolas have been key elements in the garden. Each is written with deep knowledge and insight by a specialist historian and their contributions are one of the major revelations to be found here. 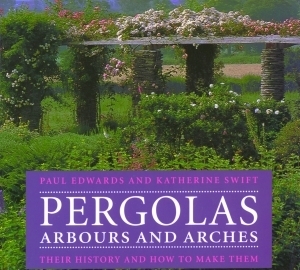 Beautiful photographs and historical images illustrate the historical progression from the Roman pergola, through medieval arbours to the grand tunnel arbours of the seventeenth century and then on into the great pergolas of the Arts and Crafts movement, finishing with some twentieth century re-interpretations. There follows Katherine Swift's highly informative and engaging tour exploring the delights of five of the finest pergolas to be discovered today at Hestercombe, The Hill, Bodnant, West Dean and Great Fosters. The descriptions take the reader back into history from Hestercombe's mighty sandstone columns to the pure romance of Great Fosters. Finally Paul Edwards expands on the principles of design and the choice of plants and then, using as examples structures he has himself designed and seen built (two for the National Trust), he lucidly demonstrates the whole process for six different projects. These are a brick columned pergola, a timber pergola, a timber tunnel arbour, an iron tunnel arbour and arches, a lime tunnel arbour and a rustic yew and topiary arch. Paul Edwards is a chartered landscape architect specialising in architectural design for the garden. He has designed many garden features for important gardens in Britain, including a number belonging to the National Trust. The drawings for several of these feature in this book. He has written articles for Country Life and is the author of English Garden Ornament and a major contributor to Recreating the Period Garden. He is a member of the National Trust's Garden Panel. Katherine Swift trained as a rare book librarian and worked in Oxford and Dublin. She has a special interest in historical gardens and has designed the National Trust-owned gardens at her home The Dower House, Morville Hall, as a series of authentic period gardens. Her own Victorian rose arches and medieval arbours feature in this book. She is a regular columnist for The Times and writes regularly for garden journals such as Hortus.